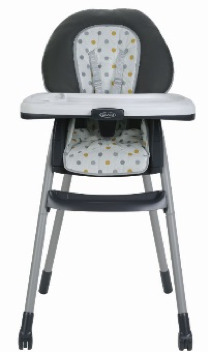 Graco Recalls Table2Table 6-in-1 highchairs due to the highchair's rear legs can pivot out of position making the chair unstable and posing a fall hazard to a child in the highchair. 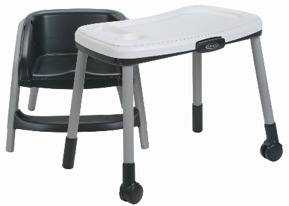 This recall involves Graco Table2TableT 6-in-1 highchairs with model number 1969721. The 6-in-1 highchairs convert to six different modes, including a traditional highchair, a booster seat and toddler chair and table. 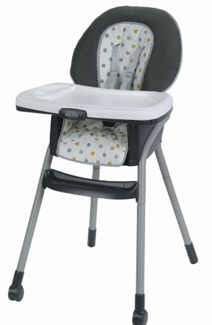 The highchair's cushion is white with gold and gray polka dots. The model number is printed on a label on the underside of the toddler seat and on a label on the back of the booster seat. Graco and Table2Table highchair are also printed on the label on the underside of the toddler seat. Consumers can contact Graco at 800-345-4109 from 8 a.m. to 5 p.m. ET Monday through Friday, or online at www.gracobaby.com and click on Support, then Product Recalls for more information. The highchairs were sold exclusively at Walmart stores nationwide from October 2016 through December 2017 for about $100.